I have a confession: I am a Vlaada Chvatil groupie. Galaxy Trucker is in my top 5 games of all time, and I rabidly wait for his new releases like some people stalk Ticketmaster for Lady Gaga tickets. And so it was with great excitement that I awaited the announcement of his newest game at Essen Spiel – the biggest show in gaming. Would it be another hilarious romp through outer space? A funky dungeon? A sequel to Bunny Bunny Moose Moose? No, it was to be a game about travel. And geography. And blogging. Huh. Never let it be said that the guy gets stuck in a rut. Travel Blog has some intriguing mechanics, but overall, gameplay is fairly simple. The instruction manual is impeccable, easy to follow, and written in the breezy, humorous tone that we’ve come to expect from Vlaada’s games. The manual recommends that beginning players learn the rules for the first two rounds before moving onto the more complex later rounds. This is a very helpful and intuitive method that makes teaching the game incredibly easy. The goal of the game is to take several travel assignments for the titular travel blog – broken into the six main rounds of the game – and save the most money possible while doing so. 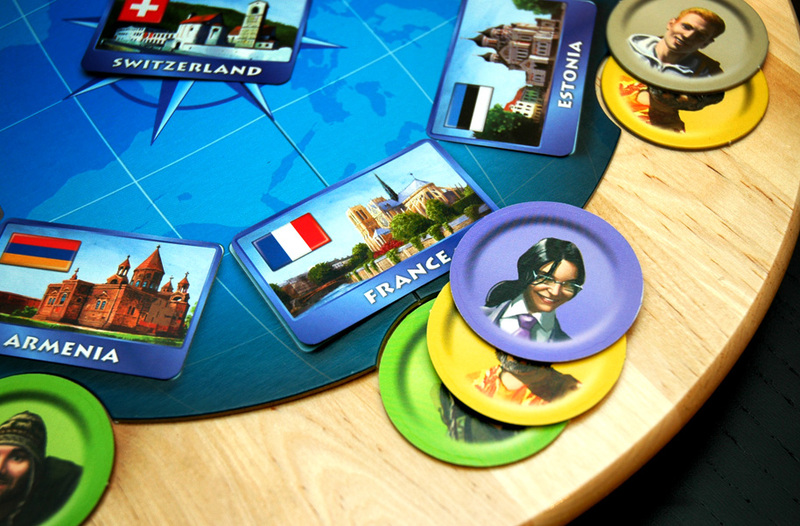 To start off, players choose a character placard and take the two matching character tokens and 100 Euros in cash. Each round, seven cards are dealt onto the blank spaces on the game board. These will either have the name of a country (when playing the European map) or state (for the US map) and represent the possible assignment locations for that round. 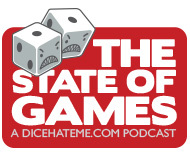 Just as in the game manual, any reference to “state” from here on out can refer to a country or a state. This will also prevent me from tearing my hair out while writing the rest of the review. In rounds 1 and 2, one additional state card is dealt to the center of the board. This card represents the location in which all players begin their assignment. Each player then picks up one of their character tokens and places it in front of any state card that they feel can be reached from the starting location by the fewest border crossings. However, players must also be careful not to choose a state card that is adjacent to the starting location. If they do, they’ll have to cough up 30 Euros, and all the other travellers get to laugh at them. Basically, the trick of Travel Blog is to figure out just the right amount of travel without staying too close or straying too far from the starting location. Ouch! States adjacent to any other states can cost a player 30 Euros a piece. After each round, the appropriate map (that was kept hidden during play!) is unfolded and players’ routes are scored by counting the number of borders crossed between the two locations. Each border crossing costs the player 10 Euros. In addition to the 30 Euro penalty for adjacent locations, players also suffer a 10 Euro penalty if their character token was placed in a location that already contained another character token. Players receive 200 Euros at the beginning of round 3. 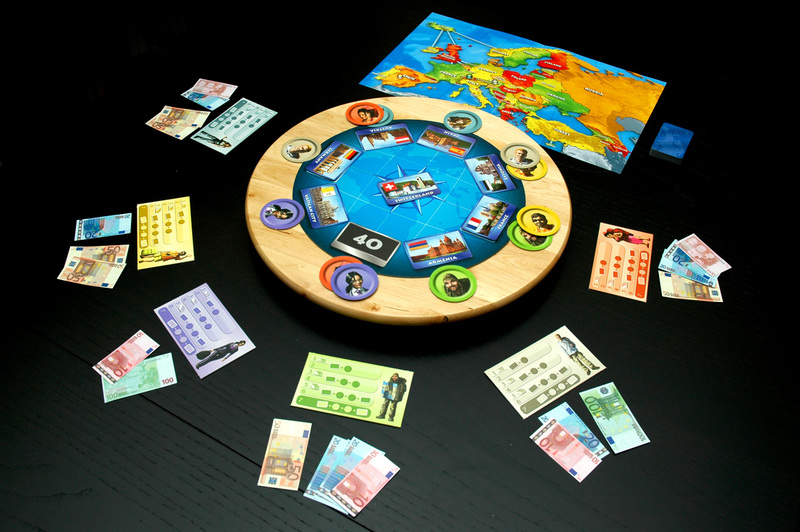 In rounds 3 and 4, cards are dealt and play is the same as in rounds 1 and 2 except that players now must place both of their character tokens around the board. In scoring, players will travel from the start location, through one of their chosen states and end in their other chosen state. The stakes are raised considerably, as players are more likely to stack up on multiple locations and a new penalty is introduced – 30 Euros if a player’s two chosen locations are adjacent! France is popular this time of year. Stacked character tokens incur a 10 Euro penalty - and they add up! At the beginning of round 5, players receive 300 Euros. Rounds 5 and 6 are played similar to previous rounds, but now two state cards are put in the center at the end of dealing. 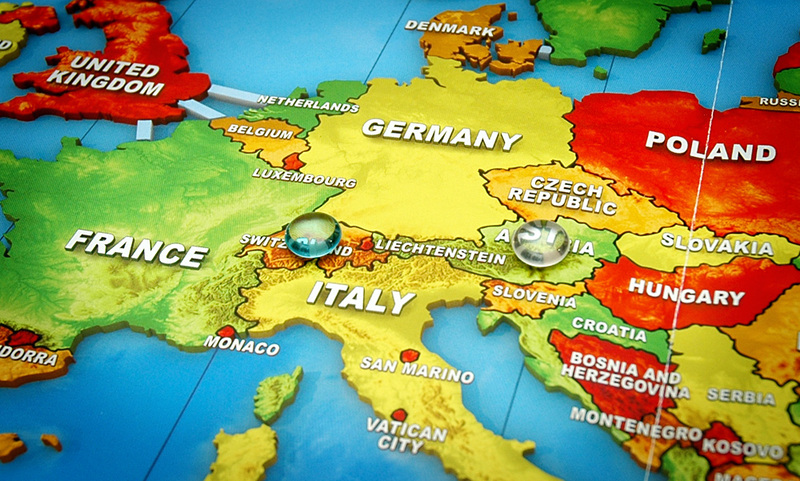 These represent start and end locations on the map, and players place their character tokens as usual, trying to be stingy with their Euros. In the final round 7, everything players have learned up to this point is moot, and the rules of the game are reversed. Now, the travel blog is sending players on an all-expenses paid vacation, so players want to take the longest trip possible. Penalties from previous rounds are now bonuses, so players can also try to visit adjacent locations to rack up the cash. After scoring, all players count their dough and the player with the most Euros is the winner! Overall, Travel Blog is quite a strange little gaming experience. I can’t say that I’ve ever played a game based around geography unless Mr. O’Brien teased our brains with one back in 7th grade. The components, the mechanics and the theme all culminate in a decidedly quirky but altogether pleasant gaming experience that can only be described as, for lack of a better adjective, so very European. And yet, despite that European label, the presentation throws off some very non-European vibes. The front of the box depicts actual, honest-to-goodness, normal smiling people. There is not even a hint of a grimacing 16th-century noble or a renaissance accountant with a terribly bored look on his face. In the end, it’s this undefinable juxtaposition of sensibilities and gameplay that makes Travel Blog a curiosity fit for most any gamer’s library. First of all, let me reassure everyone out there: you don’t have to be a geography whiz in order to be competitive in Travel Blog. Two of the players in my lunchgames group - Sally Thinksalot and Clover Leaf, specifically - wouldn’t know Europe from Middle Earth, and at the end of their inaugural game Clover tied for first, while Sally was only 20 Euros behind the lead. Besides, based on a split-second decision, would you know whether a trip from Lithuania had fewer border crossings to reach Macedonia or Monaco? (The answer is Monaco, with four - and if you did know that, I’m not sure I want to play Travel Blog against you) The variety of play options - two separate maps, random card placement from round to round and game to game - offer quite a bit of replay value. However, after a few games, the geography could start to get stale. Hopefully, Z-Man will release some inexpensive expansions to add more maps and cards to the mix. My biggest pet peeve in gaming is paper money. I loathe paper money. Paper money is fiddly, fragile and a total pain in the buttocks to pick up, deal and keep track of during play. Travel Blog has paper money. Now, with all that said, Z-Man has pulled off a minor miracle - I don’t mind this paper money. Because the euros are printed on slightly sturdy, glossy poster stock, they don’t stick together. Also, in a touch of genius, each denomination is a different size, just like real euros, which makes keeping track of things mid-game much easier. The remaining components are top-notch, with nice art, easily-shuffled and solid card stock, and thick cardboard chits, board and character placards. The theme, while well-implemented, doesn’t really evoke too much action and excitement. I could easily imagine a healthy re-theme with, I don’t know, a bunch of teams racing around the world to win a million dollars - and that’s just off the top of my head. Then again, the cheery, peace-loving demeanor of the travel bloggers becomes somewhat contagious after a few plays, creating an odd, soothing calm despite the frantic scramble to grab just the right states. Against all odds, Travel Blog is absurdly fun - for most gamers. In my lunchgames group, one of the players walked away after the second round, frustrated at the snap decisions that needed to be made and by what he considered an unfair advantage to those that knew geography best. As I explained earlier with the example of geography-challenged Sally and Clover, that unfair advantage simply doesn’t exist. However, some gamers may find the theme and mechanics unappealing, or downright silly. If any of them are in your play group, tell them to go play another round or two of Dominion while you and some other fun-seekers satisfy your travel bug without leaving the kitchen table. Overall score: 14 out of 18 - Compact, globetrotting fun, and far cheaper than a plane ticket. 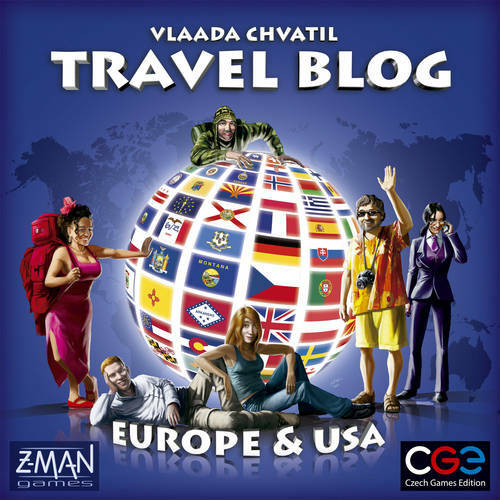 Travel Blog is a game for 2-6 globetrotters (that plays in about 20-30 minutes – really! ), ages 8 and up, by Vlaada Chvatil from Z-Man Games. It retails for about $28 and can be found online at Funagain Games or at your favorite local game store. You don’t like paper money? I bet you really prefer old-school Monopoly to the new digital versions, then. Jonathan – Curses! Ok, there’s a loophole – I’d rather handle paper money than let a computer handle it for me. Although I did kinda dig the debit card version of Monopoly. I don’t know if I’d mind if a machine counts the money for me instead of me getting paper cuts. I just don’t want it making all the decisions for me! When I first heard of this game I thought ‘Blech’. It just didn’t sound like much fun. But after this review I’m willing to give it a try. It sounds like an upgrade to the 10 Days series which I like. And it certainly is a pretty game. Tom – It plays really quickly; we can try it out when you come over, for sure. I’ve never played any of the 10 Days series, but I’ve heard good things. I’ll bring one of the 10 Days games if you like. May I request Word On The Street? Tom – Of course! Word on the Street is awesome. We’ll actually be talking a bit about it in the next podcast.